The Polsinelli Transactional Law Center creates unique scholarly and training opportunities at KU Law by combining the resources, attorneys and client base of a national law firm with the rigor of a Tier 1 research university. The Center serves as the umbrella for transactional law courses, symposia and programming related to mergers and acquisitions, joint ventures, financing, real estate and other business transactions — arming students with the practical skills necessary for successful careers. House professional skills courses for students interested in transactional practice. Host a speaker series on topics relating to corporate, health care and real estate law. The Center was established in 2016 with generous support from KU Law alumni and friends employed by Polsinelli, a law firm that employs more than 800 attorneys in 20 offices, serving corporations, other institutions and entrepreneurs nationally. The firm counts among its partners and associates many KU Law graduates. The Polsinelli Transactional Law Center offered its inaugural course in Spring 2016 and is expanding offerings that provide students with hands-on experience in transactional law. Veteran attorneys help teach Due Diligence in Business Transactions, a skills simulation workshop that provides invaluable guidance and feedback as students practice their skills with peers. Instructors for other transactional skills courses bring decades of practice experience to the classroom. This workshop exposes students to the due diligence process that is critical to every business transaction. In a realistic due diligence setting, students learn the fundamental scope and goals of the process, identify the typical issues that must be analyzed, practice using a framework for systematically accumulating information, and understand how that information may affect the structure of the transaction and the content of the agreement that memorializes it. 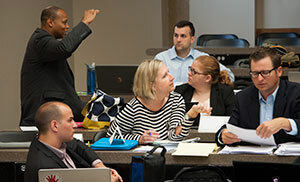 The course is taught by KU Law faculty and experienced transactional attorneys. This intensive skills course is designed to teach the principles of contemporary commercial drafting, including how to translate a business deal into contract concepts; draft each of a contract's parts; draft with clarity and without ambiguity; add value to a deal; work through the drafting process; and review and comment on a contract. This simulation and professional writing course serves as an optional lab component for students who are concurrently enrolled in Mergers and Acquisitions or have previously completed it. This course introduces students to the ethical, structural and technical aspects of negotiating and drafting the documents that bring a business transaction to life. By following a complex business transaction from start to finish, students will gain experience grappling with the types of tasks and issues common to a deals practice in a way that bridges the gap between law school and practice. The course will also help students prioritize their clients' business objectives and understand how deal lawyers create value, manage risk, and work toward optimal outcomes for their clients. The course will be co-taught by law school faculty and experienced transactional attorneys. This course is part of a national competition, the goal of which is to provide participants with a meaningful and realistic simulation of transactional practice. The competition involves regional rounds followed by a national round of regional winners. Each round consists of three distinct phases. First, students work in teams of two or three to prepare a proposed draft agreement on behalf of one of the two parties to a business transaction. Second, each team prepares mark-ups to draft agreements prepared by the opposing teams they will encounter at the regional or national site. Finally, the teams meet to negotiate the final contours of the deal.